Chris Edgar hit four of the goals for Ballymacash YM when they completed the treble for the first time with a 5-2 win over Sandy Row in the Supplementary Cup final at Stanley Park on Friday night. Not surprisingly Edgar was named man of the match and Dexter Faulkner got the other Ballymacash goal. But, ‘Cash had to come back from going an early goal down when Terence Morrison found the net for Sandy Row. However, the Young Men hit back to take a 4-1 lead before Sandy Row narrowed the gap with an own goal. This was the first time Ballymacash had achieved a treble success, which followed a trophyless year last time out. They started back on Boxing Day by winning the coveted Ironside Cup against Warren YM, but the other successes were not achieved until the final weeks of the season. Indeed, Ballymacash lost to Braniel YM in the Gordon Hanna Trophy final, before coming back to beat Braniel in the Premier Division play-off on the previous Saturday. 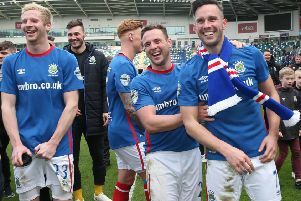 They completed their trophy haul with a win over Sandy Row and the celebrations began. To add to the Ballymacash season of success their second eleven were comfortable winners of Division 1 and added the Supplementary Plate for a clean sweep in this division. Five trophies on the sideboard - not a bad year at all.